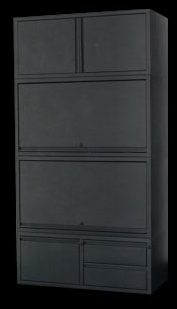 Modular steel office cabinetry uniquely suited for your home. Working from home doesn't mean settling for anything less than the best. While corporate designers coordinate filing cabinets and utility cabinets with workstations to create an efficient and professional workplace - you need it all, and you need it all in one place. With Can-Am you choose from a variety of modules that serve different purposes and then combine to create a unified multi-functional furniture solution. Open for business or closed for family time. Efficiency by day, privacy and security during off hours. Nowhere does cabinetry play such a vital role in helping you balance work and play than in your home, and nobody knows that better than Can-Am. 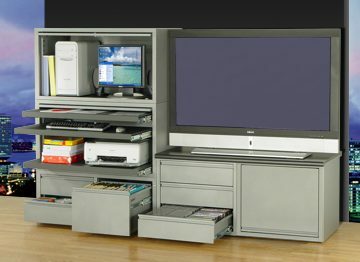 Since 1978 Can-Am has provided matching modules so you can sleep tight knowing you made the right home office furniture decision. As you evolve, specific needs will require cabinetry. Whether it be for additional workstations, storage or for hardware, Can-Am will provide matching modules that will integrate seamlessly with your setup. You, more than anyone, know what you need, where you need it, and what space you have available. Don't design your workspace around the furniture, design your furniture to fit the workspace. You will be more productive if everything is in the right place. Design a desk tailored to your needs, comfort and preferences and carry that thought and theme to a matching credenza and complete home office furniture solution. From mailing stations to printer and fax stands. Your only limit is your imagination. Place file storage, media archives, rollout work surfaces and jumbo keyboard trays exactly where you need them. It's simple. Try our 'GoConfigure Drag & Drop Design Tool' to see just how simple designing your dream workplace can be. 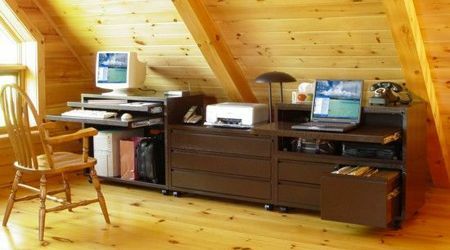 Because it's your home office, space sometimes dictates that your business empire is run from the den or a spare bedroom. 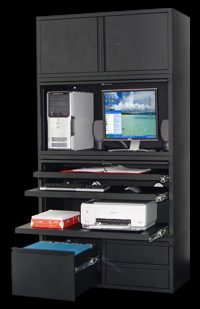 Combine your computer station or desk with other storage or furniture needs and create a great looking, multi-tasking configuration. During the day it's the nerve center of your business. At night it's a haven from the pressure of work. Relax and enjoy the flexibility of a furniture solution that works as hard as you do. It's simply Can-Am.